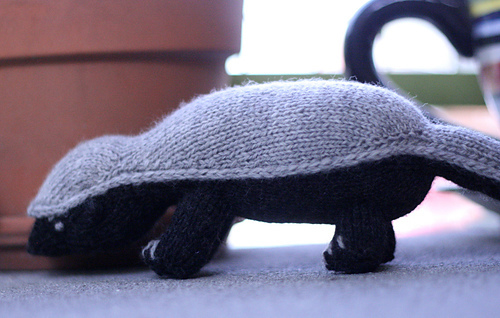 13 inches (33cm) from nose to tail, 4 inches (10cm) tall at widest point. Yarn: 50 yards in Color 1, and 60 yards in Color 2 of Sport Weight yarn. 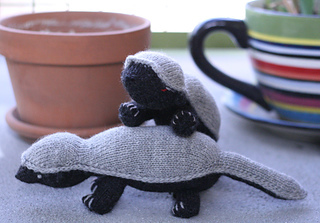 Sample shown in Cascade 220 Sport (100% Wool, 164 yds per 50gm skein) in 8401- light grey (Color 1) and 4002 – charcoal (Color 2); 13 wpi Scraps of red, brown and black yarns for embroidering eyes, claws, and nose respectively. Use brown for happy honey badger eyes. Gauge: 24 stitches and 35 rows per 4 inches (10cm) square in stockinette stitch. Needles: Set of 5 double points in 3.25mm (US 3) or sizes needed to obtain gauge. Also either one long (32” or longer) circular needle in same size, or 2 of any length in same size (see note). 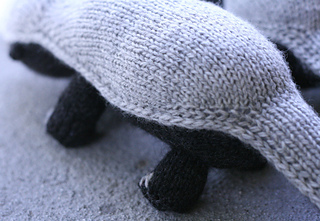 Finished Size: 13 inches (33cm) from nose to tail, 4 inches (10cm) tall at widest point. Notions: Tapestry needle to weave in ends and embroider features, stitch marker to denote beginning of round, crochet hook to pick up stitches. Techniques Used: knit, purl, knit front & back, knit front, back and front, m1, m1p, k2tog, k2togtbl, ssk, p2tog, p2togtbl, slipped stitches, picking up stitches, basic embroidery. The lighter back piece is worked first from the tail to the head, with a slipped stitch (I-cord type) edging. 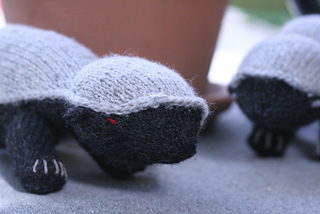 Stitches are picked up all around the back piece and the belly is knitted on and attached row by row to the live picked up stitches until you reach the snout, when you begin knitting in the round. Ears are knit from picked up stitches and legs are picked up from the finished body and knitted seamlessly down to the feet. 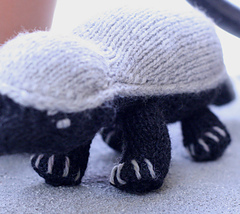 To make a larger or smaller honey badger, adjust yarn weight and knit it with an appropriate needle size. 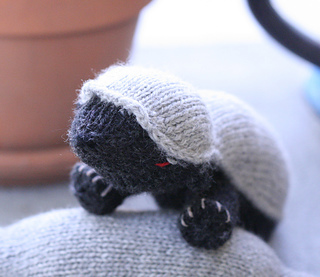 As you knit the belly, you’ll be working a decrease at the end of each row of belly stitches that works one belly stitch together with one picked up stitch. The belly stitches will all be on one double pointed needle, while the picked up stitches are held on multiple double points (or circulars). To make each belly row easier to work, transfer one of the picked up stitches to the tail end of the row before you start working the row. Then when you’ve worked that row, transfer a picked up stitch to the tail end of the next row before you work it. Slip the stitch onto the end of a RS row as if to purl and slip the stitch at the end of a WS row as if to knit. Pick up stitches through the fabric using working yarn, and place a loop onto the needle as shown in this tutorial. When you pick up stitches from the back piece to knit the belly, it is best to use a circular needle or needles. The flexibility of the cable makes it easier to transfer stitches from the circs to the working double points for the joining decrease at the end of every row. A 32-inch or longer circ should be used and looped (like in the magic loop technique) near the middle of the bind off edge, or, optionally, you can split the stitches onto two circulars to accomplish the same end. Stitch counts given during the belly portion of the pattern are ONLY counting stitches in Color 2. The picked up stitches in Color 1are not counted in the stitch totals until you join in the round at the snout.